Locate excessive costs and make intelligent decisions. 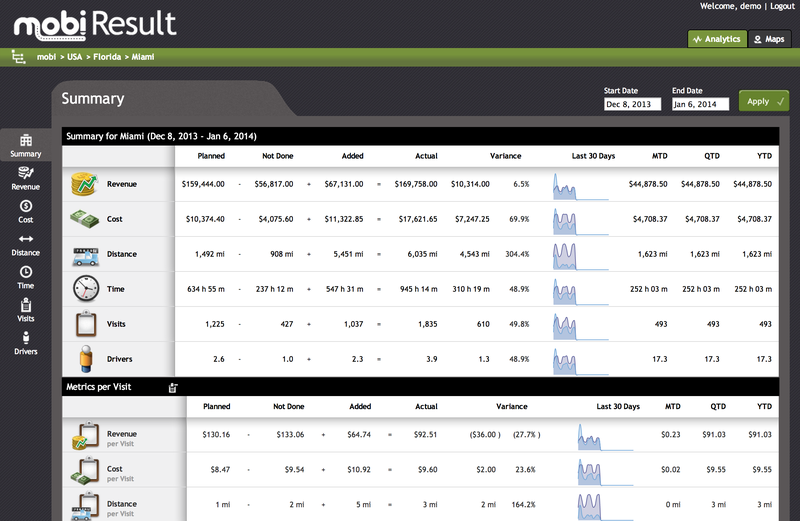 mobi sheds light on your daily operations and allows you to easily track your assets at any time. Immediately know where your team spends their time. 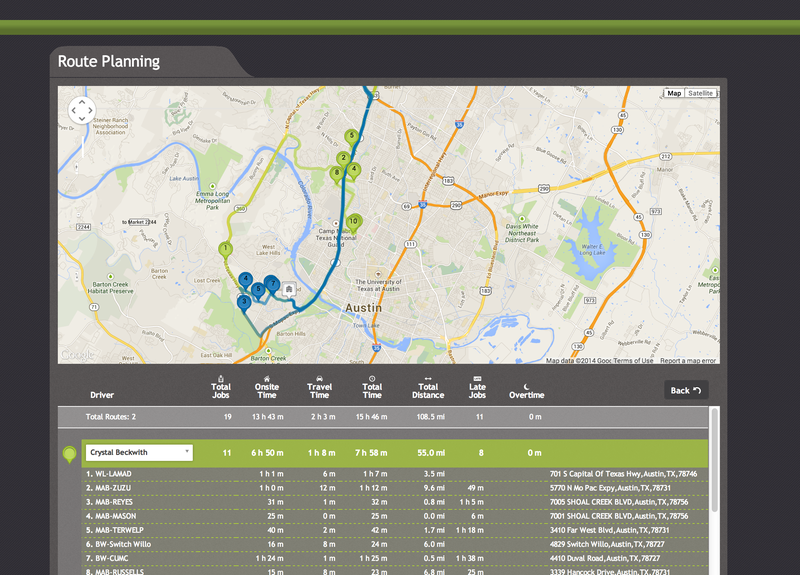 Not every day is the same, so mobi has developed suggestive route planning software to minimize risk and keep your operations running smoothly. Do you know if your team is executing as planned? 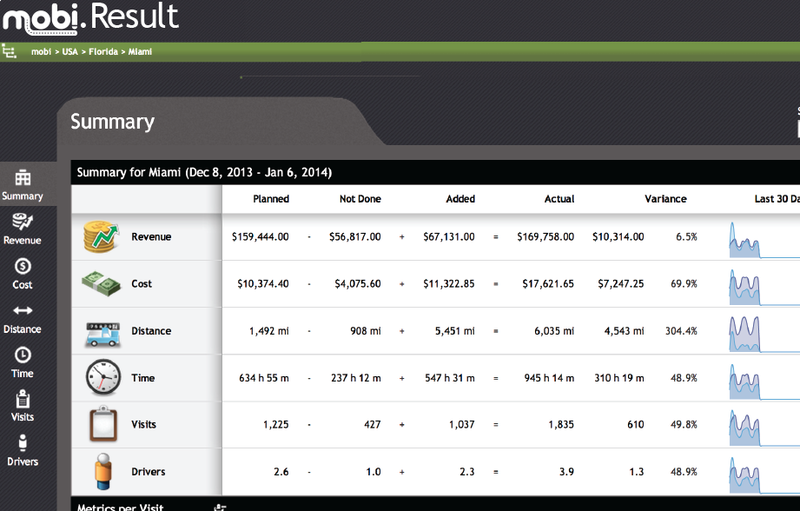 mobi’s GPS analytics shows your cost of operations, variances and deviations from the set plan. 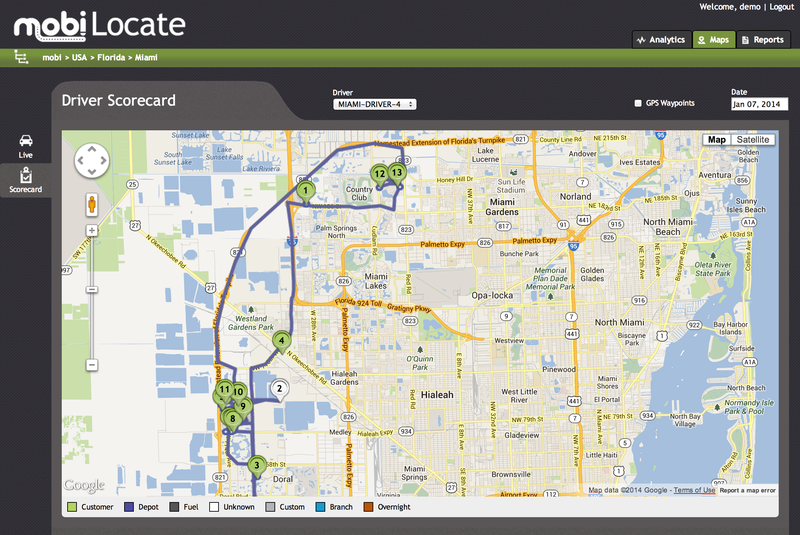 mobi provides software that links to GPS tracking devices in order to harness its data as business intelligence. Operations people with P&L responsibility use it to get visibility into previous activities, their impact, and use those trends to inform future administrative changes. To folks in industries like Service and Delivery, Construction, and Home Health Services this sounds sort of like a fleet management tool, although mobi's economic modeling platform is unique in the industry. But the truth of the matter is that since joining BSM Wireless, and beginning the process of marrying the disparate features of BSM and it's other recent acquisitions the journey towards becoming a true IoT company with industry impact across a wide range of verticals is now underway. It's an exciting stage. It's an exciting time for technology, software development, logistical networks, telematics, and the convergence of all the above. There are so many layers to the general trend towards connectivity in technology. Just to scratch the service of the implications IoT will have on consumer service fleets, specifically as it relates to improvements in customer satisfaction is the intention of this essay. Today, the main goal with service organizations is to complete their intended jobs while keeping the customer satisfied. Customer satisfaction and positive feedback has become increasingly important especially when seeking customer loyalty. Some of the best service organizations use IoT devices that focus on what is best for the customer. Studies by technology publisher Aberdeen Group have shown that the service organizations that make customer service a priority produce an average of 7% higher performance levels across the board. It should be no question why IoT devices specifically geared toward customer satisfaction would be beneficial to any business. However, the benefits go beyond that. It has been found that using IoT devices to improve customer satisfaction, service organizations improve as a whole. Tom Paquin, put together an article, "IoT and Field Service: Leveraging Connected Devices To Provide Exceptional Service,” with data showing that as customer service is tended to, the overall operational efficiency follows. Paquin found that the top organizations using IoT technology experienced a 12% increase in employee productivity while organizations more reluctant to use IoT saw a mere one percent increase. The data seems to show that if the customer is happy, everyone is happy. Putting the customer first requires attention from all angles. A business can never assume that because a customer used their service once and were satisfied, that customer is there to stay. Many leading service executives list retaining current customers as a challenge. When a company has hundreds, even thousands of customers in their system, keeping up with them and ensuring every single one of them is satisfied in no walk in the park. This challenge is something IoT technology can help with tremendously. IoT devices can pinpoint the areas of excellence and the areas that may need some improvement. The devices can track the employee productivity, the service parts and service vehicles in order to eliminate any problems before they may happen. Additionally, the devices collect customer feedback and ensure the customer is paying the correct amount for the services they are receiving. Many service organizations make the mistake of using IoT technology to gather data solely on their company and product in order to better themselves. This may seem like an efficient business approach but it does not produce the same kind of results. The idea that if a business has the best products and business plan then they will be the most successful makes sense initially. However, customers need more than this kind of surface level service. An average customer is more likely to remain loyal to a company that keeps their needs in mind. But of course, it goes without saying that a balance must be struck between delivering customer value and maintaining appropriate cost levels. Data fed into a centralized platform from different devices that are part of service execution can also bring into the fold the expenses for that execution. This is the kind of well-rounded IoT solution that can have real economic impact to industry and commerce. For example, a telecommunication company that deploys perhaps hundreds of service vehicles across a region to perform new customer installs or regular maintenance work would be well served to have GPS data fed into a centralized hub. Doing that would make it possible to run different analytical programs that could optimize their routes and schedules to find the most efficient means to fulfill time window promises while cutting down on the time spent driving to different locations. This would have the duel effect of maintaining established service level agreements with customers but also reducing the cost per stop, per vehicle. The aggregate cost savings organization-wide would be massive. Re-deploying assets freed up after insights derived from proper analytical processing would mean opportunities for new growth could be explored without incurring a new expense. Herein lies the possibility for survival for consumer and business to business service companies struggling to differentiate themselves. In the marketplaces of the modern era it is only the innovators that survive. A company that has a good product, arrives on time, operates efficiently, has reasonable costs and takes feedback into consideration will often come out on top. When running a service organization, it is important to keep things running efficiently in order to maximize revenue. Connecting your various assets provides the visibility required to do this. Technology is developing today that allows business owners and operators to create value by not only fulfilling customer expectations but by surpassing them. I'm glad to have a tiny part to play in the developing innovation. It's a great time to be a consumer. Today, in 2017, the customer has more power than ever. This forces company to compete more fiercely, and thus strive to reinvent themselves, to develop new and additional value. Staying on top of customer retention has never been so important. All good news for the consumer and great fun for the people who work to make it so. Does your field service operation have a 92% success rate when it comes to meeting response times per service level agreements (SLAs)? According to this report only the top performers in the industry are meeting that number, which means there are a lot who aren’t fulfilling their SLAs. That puts consumer service companies in a tough spot. The industry as a whole is getting more and more competitive every year as new companies join the market place and customers’ price sensitivity increases along with their expectations. As mentioned in a previous article on real-time driver reporting GPS tracking and location visualization are giving companies a way to keep up with customer expectations. But, of course, the inclusion of this tool into your fleet is only the first step toward remaining competitive nowadays. Getting an edge involves moving beyond location technology. The next evolution of GPS comes in the form of the insight one can gleam from all that data. Information just isn’t worth anything if it isn’t actionable. With the right tools delivering actionable data it becomes possible to improve the efficiency of daily routing, planning, and scheduling. This has a two-fold benefit. The first part is concerned with preserving the business’s current success in the market, sustaining its customer base by meeting SLAs while also minimizing operational costs. The second is concerned with planning for future demand. Foresight into how resources, be it personnel, equipment, or all the above, are going to be taxed in the future is critical to getting the right technician, with the right solution for the right customer, all at the right time. But improving forecasting and planning for future service demand is really only going to come once the major hurdles faced in daily operations are overcome. Moving past the major challenges, namely, cutting costs, increasing field efficiency, compensating for your aging workforce, and a high turnover rate, necessarily comes first. Some questions: if you manage a mobile workforce, are you often dealing with frustrated workers who spend most of their day driving and not servicing customers? Are they passing other company vehicles going the opposite way all the time? Are they filling up your voicemail and inbox with complaints about going out on service calls where the issue they’ve been sent to address requires a different skillset, different tools, or help from other technicians who were assigned elsewhere at the time? Are they quitting because of too many times going it alone, without what they needed to really get the job done and are tired of dealing with angry customers? This is poor planning, and the scenarios described are all contributing to the top business challenges currently being faced out there. Getting the best of the planning conundrum means getting the best of permutations on top of permutations. Good luck! Companies that service multiple clients (that regularly change) multiple times a day in multiple locations are hard pressed to ever make sense of it, let alone align daily operations with year-end economic, or business goals. However, technology does exist to not only create geographically defined service areas for techs with different experience levels, customers with different demands, SLA defined time windows and other constraints, but the ability to compare the costs of various what-if scenarios and see the impact on a business’s profitability. Properly aligning customers and field service crews, along with cutting down windshield time improves worker morale and slows employee churn, or even stops it completely. But this can’t be accomplished without the ability to track and measure individual activities. And that ability isn’t going to be worth much if what’s reported on isn’t set against the right business goals. Being able to audit different metrics, like percentages relating to the fulfillment of SLAs means not just having the technology available to help optimize daily routing, planning, and scheduling, but to analyze the results. With this you can empower your field workers. Technicians are not commodities that are replaced with ease and with little expense. Hanging on to them needs to be a core business principle. Otherwise, there’s no chance in hell of meeting that 92% success rate. Wonder where your drivers are? 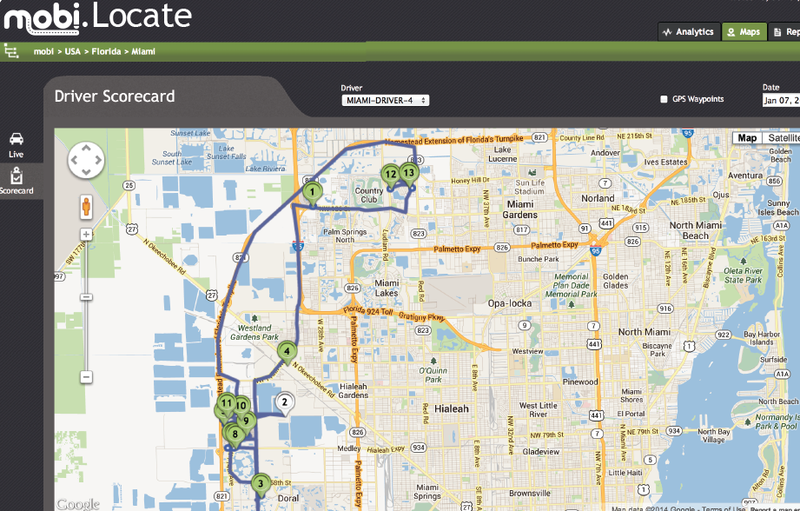 Find your trucks any time in real-time with mobi.Locate.